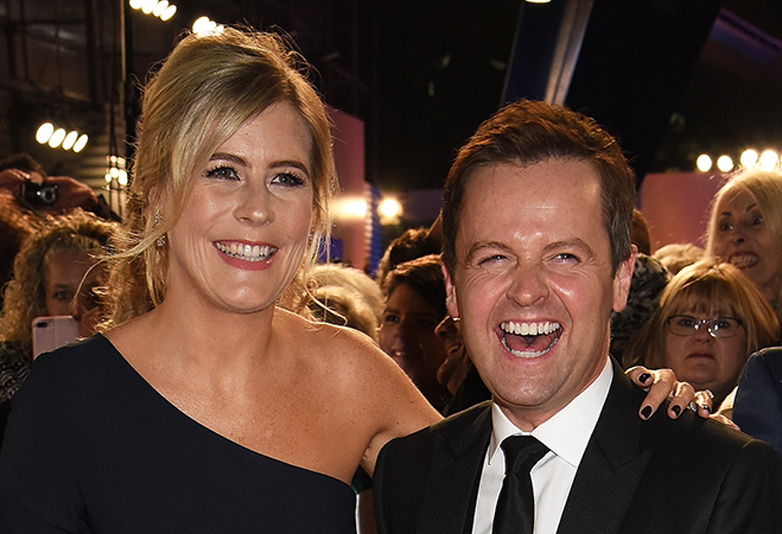 Declan Donnelly and his wife Ali Astall have welcomed their first child into the world, a baby girl called Isla. The happy couple confirmed their daughter’s birth on Twitter with Dec writing that both mum and daughter were both doing well. The couple announced they were expecting their first child earlier this year in March but Dec – who is one of seven siblings himself – made no secret of the fact he’s always wanted to be a dad. In an interview with the Mirror the I’m a Celeb star admitted kids were absolutely on the cards for him and Ali. Dec first began dating Ali, who is his and showbusiness partner Ant McPartlin’s manager, five years ago and the pair married in 2015 at St Michael’s Roman Catholic Church, Elswick, Tyne and Wear. The Mirror reports that the pair started trying for a child soon after they tied the know with Dec commenting at the time that children were the next stage of our lives’. Dec confirmed that he and Ali were expecting on March 25 with a black and white throwback photo from their wedding day. Just wanted to say thank you for all the lovely messages. The news has sneaked out a little earlier than we had hoped but Ali and I are delighted to be expecting our first child. Thanks for all the love, we really appreciate it. At the 2018 BAFTAs, Ali debuted her baby bump with Dec confirming they were finding the prospect of parenthood ‘very exciting’ and confirmed that their child was due this September. He said at the time that he wished it would ‘come out now’ with Ali adding if they could they’d just fast-forward to to having the baby because ‘We want to get on with it’. Well, they’ve finally got their wish I suppose! Meanwhile, ITV confirmed earlier this month that Dec’s show business partner Ant won’t be returning for the next series of I’m A Celebrity Get Me Out Of Here. In a statement, Ant said he was taking time off from presenting work to focus on his recovering from an addiction to prescription painkillers and alcohol. This means that Ant will be unavailable to present the next series of I’m A Celebrity Get Me Out Of Here and Saturday Night Takeaway. This Morning presenter Holly Willoughby is set to replace Ant on I’m A Celeb. In a statement following the announcement, Dec admitted that while he was excited to work alongside Holly he was sad at the idea of travelling to Australia without his best mate, adding he couldn’t wait for 2019 when the pair will reunite on TV.